Barnes & Noble can't commit to a CEO, but back in May it made a commitment to sell tens of millions of dollars worth of Samsung hardware every year. That deal included a rebranded Samsung Galaxy Tab A 7.0, which was planned to launch by the end of the year. That tablet was released today. 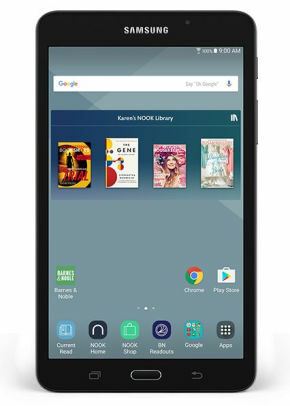 The Samsung Galaxy Tab A Nook is smaller than the Galaxy Tab E Nook which B&N launched last October. The new tablet features a 7" display, and runs Samsung's version of Android 5.1 Lollipop on a quad-core 1.3GHz CPU. It has 2 cameras (2MP, 5MP - no flash), 8GB internal storage, a microSD card slot, and an accelerometer. In terms of connectivity it has Wifi, Bluetooth, GPS, and Glomass. This tablet weighs 9.9 ounces, measures 7.35" x 4.27" x 0.34", and packs in a 4Ah battery. It retails for $139 at B&N, but can be found for less on Amazon and other sites. Samsung sells it direct for $119, and Amazon matches that price. This tablet will do little to reverse B&N's declining digital revenues, so I really have to wonder why they would even bother. The again, this is only a $10 million a year commitment; with annual revenues of $4 billion, Barnes & Noble can afford the loss on a flagship tablet. It’s really sad that Barnes and Nobles can’t really get “into” the market. I look at the rebranded Samsung with Nook software and see a Samsung tablet. I really like to get into branding and the Nook name is really a cool name to have to an e-reader. Amazon has its Kindle, Voyage, Oasis and Fire readers which all spark the imagination that we are reading from a revolutionary device. Nook is such a great concept name for “a comfortable place to read”.